The SCA-DUAL provides for advanced control of snow melting and roof and gutter de-icing systems to minimize operating costs. It operates electrically- and mechanically-held contactors for pilot duty applications. With automatic and manual override operator controls, the SCA-DUAL includes an adjustable hold-on timer to continue heater operation up to 8 hours after snow and ice accumulation stop to ensure complete melting. Featuring a weather-resistant NEMA 4X enclosure, this unit handles resistive loads up to 30 amps and operates at 100 - 277 Vac and 50/60 Hz. Has a maximum 2 sensor capability and can be used with the GTR-SS and/or AIR-SS sensors. This durable outdoor storage bin conveniently stores loose or bagged sand/salt to help keep slippery walkways safe. Use the bin at your business, home, cottage, farm, campground, or any public space where safety is a concern. This bin is also waterproof and rodent resistant, which makes it ideal for many other outdoor storage uses including animal feed, garden supplies, sporting goods, pool supplies, tools, garbage/recyclables and anything else you want to safely store. Frost's code 2000 steel salt/sand/storage container is designed to provide both a rugged and attractive storage solution for harsh environments. This is a Canadian made product constructed from heavy gauge HRS, lid 16 gauge steel, body 18 gauge steel. Rotationally moulded polyethylene storage liner included. Storage container has a counterbalanced lid for safe opening and closing and easy access. Lockable attachment included. Storage container is also perfect for storing chemical supplies, industrial tools and equipment, and any other items that require a lockable heavy duty storage solution. Sealed storage compartment helps extend the storage life of salt or sand. Holds up to 750 lbs. depending on material density. Hidden feet allow unit to be anchored to ground. With a WarmlyYours snow melting system, there is no more back breaking shovelling or harsh de-icing chemicals that can reduce the life of your driveway. Snow melts on contact ridding driveways, walkways, stairways, and patios of dangerous ice and snow. The paving material absorbs heat from the snow melting heating elements, melting the ice and snow on contact so family, guests, or customers can visit you safely. WarmlyYours snow melting mats are designed to provide even cable spacing generating 50 watts per square foot (538 watts per square meter) on average to ensure dependable and efficient snow melt performance. Mats allow for easy installation in asphalt, concrete, or in mortar beneath pavers to accommodate most outdoor snow melting projects. A free custom installation plan is available and illustrates the recommended placement of the system for your project specifications. 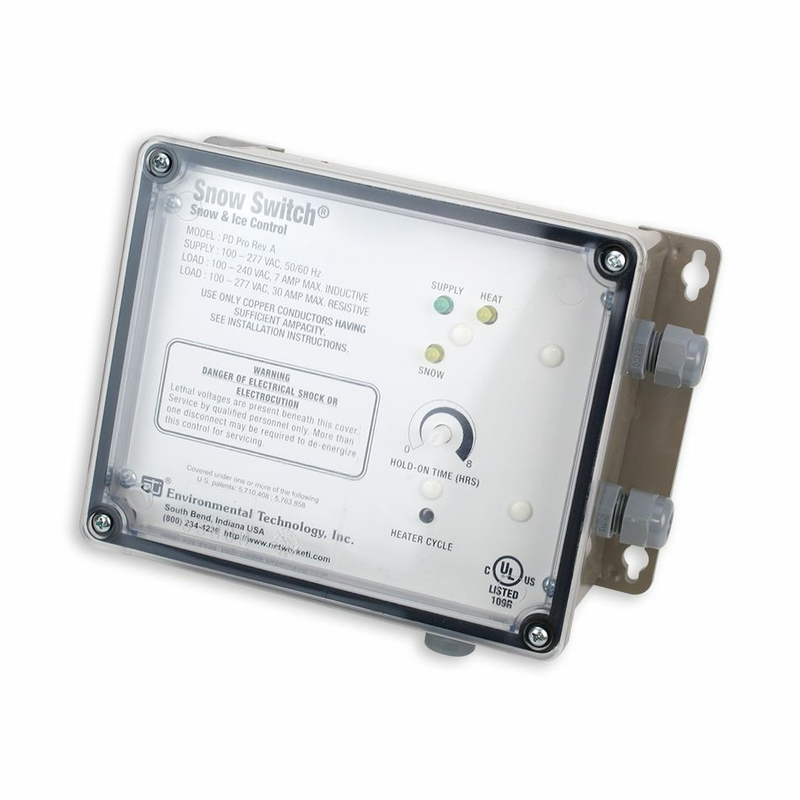 120V Advanced Snow Melting Control with Adjustable Timer The SCA-DUAL provides for advanced control of snow melting and roof and gutter de-icing systems to minimize operating costs. It operates electrically- and mechanically-held contactors for pilot duty applications. With automatic and manual override operator controls, the SCA-DUAL includes an adjustable hold-on timer to continue heater operation up to 8 hours after snow and ice accumulation stop to ensure complete melting. Featuring a weather-resistant NEMA 4X enclosure, this unit handles resistive loads up to 30 amps and operates at 100 - 277 Vac and 50/60 Hz.